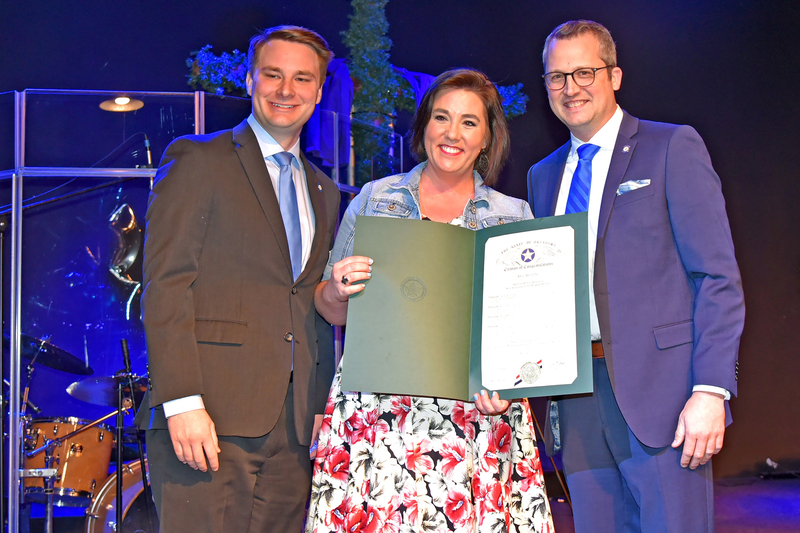 Sapulpa Middle School Teacher Aimee Redding was awarded the honor of District Teacher of the Year for 2018-2019 at a banquet held on Friday night. The award, presented by last year’s winner Natalie Fielden, who had some words of advice for Redding. “The last year has been the best of my career, and I’m sad it’s coming to an end, but I’m more than excited for the new District Teacher of the Year,” Fielden said. Fielden said that the administrator will be your biggest cheerleaders, a statement that Redding echoed when she accepted the award to a standing ovation and much fanfare. Redding said “I could not be here to win this award without the help and support of all my fellow educators out there. This is as much for you as it is for me. Thank you,” Redding said, before gathering with a group of other former Teachers of the Year for a group shot, something they do every year. Redding stands with a lineup of other Teachers of the Year. District Teacher of the Year is a process that gets pretty involved. It begins with each school selecting a site teacher of the year, which means creating a portfolio detailing your background and experience, and being selected as Site Teacher of the Year still means you have to go through a half-hour interview process. It’s a decision that Superintendent Rob Armstrong said he was glad he didn’t have to make. “It gets bigger and better every year,” he said. Redding not only won a prestigious award, but thanks to the Sapulpa Public Schools Foundation, was also given a $2,000 check. ← Dear Aunt Gabby: Should I date a guy who has a reputation for sleeping around?